Believe it or not, dear reader, this pizza is easy enough to be classified as a week-night dinner. And that includes making the dough from scratch! I love this recipe, because if I just pick up a couple kinds of cheese and 6 slices of soppressata from the deli, I can usually make this for dinner using only ingredients from the pantry (plus lemon thyme from the garden). Ina, classy lady that she is, serves these pizzas topped with an arugula salad. Andy and I choose to forgo this step. Please to enjoy! Combine the water, yeast, honey and 1 1/2 tablespoons of olive oil in the bowl of an electric mixer fitted with a dough hook. When the yeast is dissolved, add 1.5 cups of flour, then 1 teaspoon kosher salt, and mix on medium-low speed. While mixing, add up to 1/2 more cup of flour, or just enough to make a soft dough. Knead the dough for about 10 minutes until smooth, sprinkling it with the flour as necessary to keep it from sticking to the bowl. Make garlic oil. Place 1/4 cup of olive oil, the garlic, thyme and red pepper flakes in a small saucepan and bring to a simmer over low heat. Cook for 10 minutes, making sure the garlic doesn’t burn. Set aside. 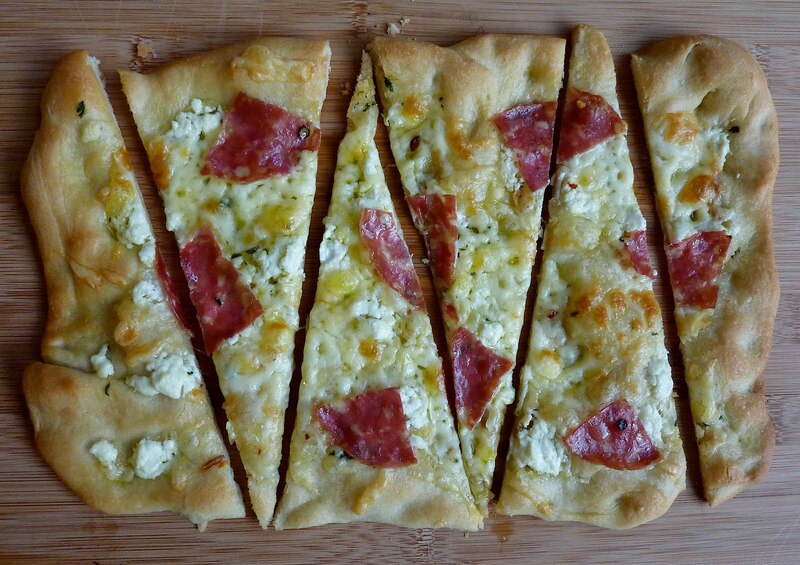 Dump the dough onto a board and divide it into 2 equal pieces. Place the doughs on a sheet pan lined with parchment paper and cover them with a damp towel. Allow the dough to rest for 10 minutes. Use immediately, or refrigerate for up to 4 hours. There is an extreme fancy pizza place in SA called Dough and the arugula topped pizza is shockingly good. also- we roasted some cauliflower and put some Parmesan on top and it was delicious. roasting veggies 4 life. Joanna! oh man- i have been omitting the arugula because i assumed it was ina's stab at making pizza 'healthy'- i'll definitely try it out next time. also, yes! about your roasted cauliflower. that boiled stuff is inedible swill. Artistry! did you click on the link? you mighta earned me 12 cents! I mentioned this to Andy. It appeals to the geometer in me that even though the pizza is rectangular, you've cut it such that each piece is triangular and has a crust. That's cool. Oh, also, the pizza looks great! haha! that's fantastically geeky- i love it!